The good news is that you won’t face a tough competition in your interview for a school counseling job. In many cases, you may actually be the only applicant for the position, or one of two or three applicants. Nevertheless, you still have to convince the hiring committee of your skills, and your readiness for the job. You will have to demonstrate strong listening skills, understanding for the problems the students face, and for the emotions they experience, as well as knowledge of various situations that happen in a job of a school counselor, and a right way of addressing each situation. And the bad news? The bad news is that you will have to deal with a variety of questions, ranging from simple personal questions to difficult behavioral and technical (job-specific) questions. Last but not least, the school representatives must see an ally in you, someone who would advocate for the students, but not at all costs. Let’s have a look at the list of questions now. Find a short hint in the brackets. What did you like the most on your studies? Do you plan to become a school psychologist later in your career? How would you approach individual student planning? How do you imagine a typical day in work as a counselor? What is the role of the school counselor in relation to teachers, parents, administrators and other counselors? How would you work with children from orphanage? If there was a conflict between a student and a teacher (or one of the school administrators), on which side would you stand? Tell us about a time when you explained something difficult to someone. How did you get your message over? Tell us about a time when you struggled with motivation in work. How did you overcome the crisis? Describe a goal you achieved in your counseling (teaching) practice, and who helped you with achieving the goal. Is there anything else we did not cover that you would like us to know about you as we consider you as a candidate for the position of a school counselor? * Special tip no. 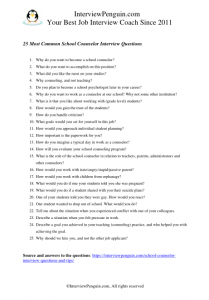 2: If you are not sure how to answer these questions (you are not alone), have a look at a new eBook I wrote for you, the School Counselor Interview Guide. It includes multiple brilliant answers to twenty five most common school counselor interview questions (including the difficult behavioral questions), and it will help you immensely in your interview. Check the eBook page and read the samples and see for yourself. Try to show enthusiasm in your answers, and ask questions. Show interest for the problems the students have to deal with, for their life, for the challenges the teachers and the administrators face at school. Remember, your personality matters more than your degree. If your answers convince the hiring managers that you have the right personality for a school counselor job, they will hire you. Thank you, we wish you good luck! InterviewPenguin.com – Your best job interview coach since 2011. Teaching and Education Administration Interviews – Interview questions for various job titles in teaching and education.